Apparently, the image quality of the Samsung Gear 360’s output is partly dependent on which method you use to stitch it, as discovered by Markr041. Mark also uploaded a comparison between the Gear 360 and the Kodak SP360 4k. Hit the jump to check it out! 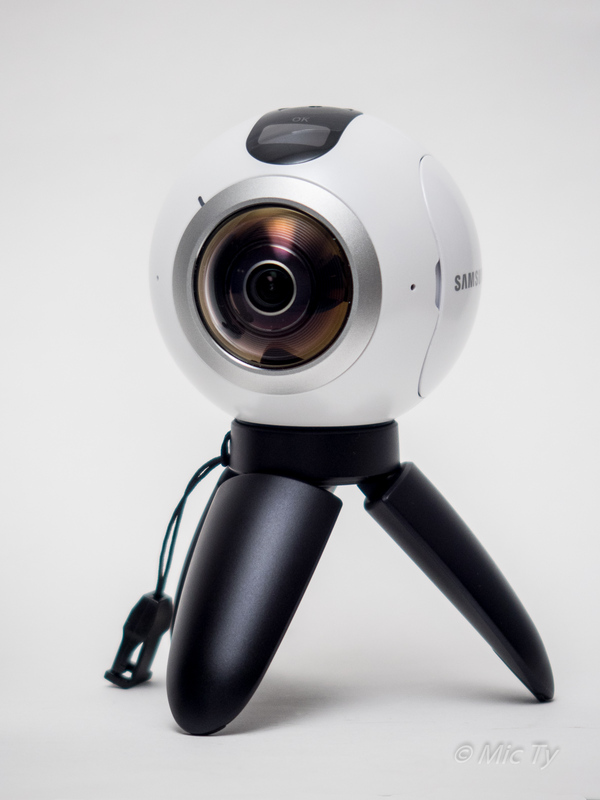 The Samsung Gear 360 video is not stitched in-camera. Instead, you need to stitch it with a compatible phone, or with the included Action Director software (or a 3rd party software if you prefer). If you stitch on an S7, you’ll get the full 4k video resolution. But if you stitch it with a Samsung Galaxy S6 or Note 5, you’ll be capped at 2k. So, realistically, you need to stitch either on an S7 or the Action Director. “1. The original file produced in the camera is H265, at 32 Mbps. HEVC or H265 gives approximately the same quality as H264 at double the bitrate, so equivalent to about 64 Mbps H264 (about what the GoPro shoots in 4K). 2. When you save the file on the camera to the device (Samsung Galaxy S7) you get a stitched 360 file (equirectangular) that is H264, with a bitrate of 61 Mbps. The audio is AAC 192 kbps, at 48Hz. 3. You can also create a stitched file using the free Action Director software on the PC. Take the unstitched video files from the microsd card and load them on the PC. Here is the related thread on DPReview. I haven’t verified either way (because I don’t have an S7), so I don’t know who is right or wrong about this issue. “PSA: Action Director does not mangle your shots. The S7 does not offer significantly better stitching. That is a complete falsehood spread by bloggers and reposters who never investigated the issue – in fact the person that first came up with the theory never even compared the actual images, basing the whole thing on incomplete evidence and numbers that don’t tell the whole story. Higher compression ratios in h264, ie smaller files, require significantly more processing power which the S7 doesn’t have. The higher bitrate that the s7 stitcher outputs is just a crutch to deliver decent quality with this reduced processing power. The Action Director software has more flops at it’s disposal and is able to compress the footage much more efficiently. I’ve done many comparisons and Action Director does not add any artifacts that weren’t already there in the double fisheye. “Also, after further testing today I am convinced that the S7 stitched videos actually have lower image quality than the PC stitched files. The phone stitcher adds significant smoothing to the image that isn’t there in the double fisheye, probably in an attempt to minimize artifacts from the much less efficient compression. What do you think? Pls. post your thoughts in the comments! You can also click on the label/tags below the sharing buttons to find other related posts. Hi everyone. I was not getting notifications anymore from Google comments, preventing me from responding, therefore I switched back to Blogger comments. Unfortunately this had the effect of deleting past comments from Google+. See here: http://360rumors.blogspot.com/2017/01/psa-thank-you-and-my-apologies-for-not.html Thank you for your patience and understanding. PSA: Action Director does not mangle your shots. The S7 does not offer significantly better stitching. That is a complete falsehood spread by bloggers and reposters who never investigated the issue – in fact the person that first came up with the theory never even compared the actual images, basing the whole thing on incomplete evidence and numbers that don't tell the whole story. Higher compression ratios in h264, ie smaller files, require significantly more processing power which the S7 doesn't have. The higher bitrate that the s7 stitcher outputs is just a crutch to deliver decent quality with this reduced processing power. The Action Director software has more flops at it's disposal and is able to compress the footage much more efficiently. I've done many comparisons and Action Director does not add any artifacts that weren't already there in the double fisheye. This information applies to full-motion video, not timelapse where there is a bug in Action Director, and requires using the software in what may seem an unusual way in that you don't export from the software at all, just grab the stitched files from the program's working directory revealed in the settings. The program autostitches clips in the background as soon as you import them and saves them in the aforementioned working directory, just grab them from there a short time after importing and take them to other video editors at that point. The user that originally posted this at dpreview, as well as the owner of this blog were both very very rude to me when I pointed out their mistake. I have been threatened with lawsuits over this. I expect this post to disappear like my previous one, but I am posting it many other places beyond their reach. The user that originally posted this dpreview, as well as the owner of this blog were both very very rude to me when I pointed out their mistake. Hi In Film. I swear to God I am not attempting to censor you. The comments are disappearing by themselves, possibly through algorithms that have labeled your comments as spam or something. In fact I posted your point of view on the article itself, and I pointed that out to you. I also linked to the DPReview thread so everyone can discuss it. Hi In Film. If I'm attempting to censor you does it make sense that I would quote you in the article and identify you by name so that people can see your perspective? How does that make sense? To further prove that I am not trying to censor you, I will paste in the body of the article itself everything you have posted (which were emailed to me automatically). People can read and evaluate your comments by themselves. How's that? Hi In Film, I cannot do anything about Blogger's algorithms. They are beyond my control. However, if you look at the article now, you can see I reposted all your comments. If I missed anything, pls. let me know. Thanks. It's possible that because you have made several comments within a short time, Blogger automatically labeled it as spam. If you do want to discuss further, I recommend you continue the discussion on DPReview. AFAIK, Mark has not used any abusive words toward you the last time I checked. The rudeness at DPreview occurred in private messaging. Simon (I assume it's you and not one of your colleagues), I think we need to take a deep breath and calm down a bit. The 360/VR community is very small. It does no one any good to throw mud at each other, which is why you might have noticed I have not said a single disparaging word about In Film or your work. Hi In Film. I anticipated that you would not agree with my summary of the events. Therefore I will post a link to the Ricoh thread where we had our discussion so everyone can evaluate for themselves. That's fair, isn't it? Hi In Film. I don't expect you to believe me about why your posts are disappearing. [I do have a coauthor – I plan to ask him if he's the one who deleted your comments.] In any case, as you can see I reposted your previous comments on the article itself. I hope that you see that is evidence that I'm not trying to censor you. Your blog is the the source of most of the corrections I have to make on this issue, so with your edits today I feel the discussion is more balanced and acceptable, and I will give it a rest. Also, after further testing today I am convinced that the S7 stitched videos actually have lower image quality than the PC stitched files. The phone stitcher adds significant smoothing to the image that isn't there in the double fisheye, probably in an attempt to minimize artifacts from the much less efficient compression. This could have the effect of fooling some viewers into thinking the phone stitch has better quality, when in actuality is has far less fine detail. You don't notice this unless you compare all 3 images, including the unstitched double fisheye. Hi In Film. Thanks for looking further into it. If you want, I can post your test results, along with a link to your site. Just let me know. Hi InFilm. Guess what. I was going through the spam comments and I found your comments there (the ones that disappeared). I've marked them as "not spam" and reposted them. I would like to see your test results. This is fascinating. Love the nerdy detail. I use one of these for my law practice (to show 360 views of road conditions). I was a Samsung 360 early-adopter with the first international version. Then I got the v2 earlier this year. Any update for the Samsung 360 v2? Is it any different? Hi Michael! I’m glad you enjoyed this post. I will be posting a multi-camera comparison that will include the 2017 Gear 360, 2016 Gear 360 and Kodak SP360 4K.